The majority of air compressors work on positive displacement, this means a fixed volume of air is delivered from each rotation of the compressor. Piston compressors are the most common form of compressor for compressing air, some smaller compressors use a single cylinder compressing air in one direction of its stroke, this type of compression method can however cause an uneven air supply, this can be due to pressure being lost through use of the air supply while the piston is moving back drawing in more air. 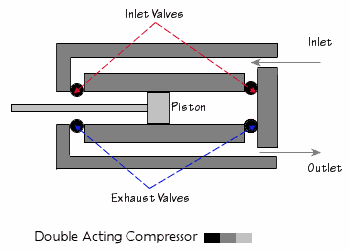 The double-acting construction (shown below) uses both sides of the piston and compresses on both strokes during one revolution, this gives a smoother air supply. 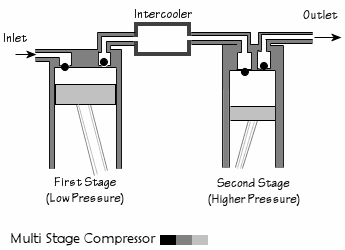 The above image shows a combined two stage compressor which is fine as it is, however when high pressures are required from a compressor set up like this then the compressed air temperature can rise to over 200°C and motor power needed to drive the compressor rises with this temperature. So for these higher desired pressures it is far more economical to include a cooling system between each stage, this would then be known as a multistage compressor. These cooling systems are commonly known as intercoolers which work by drawing the hot compressed air over a very large surface area where the heat can dissipate quickly, this cooled air will then enter the second stage compression to be compressed even further by the last piston.